Honest and meaningful music is what caught T. Bone Burnett’s ear. The Secret Sisters certainly caught our collective ear with their clean and close harmonies — they really are sisters, after all. 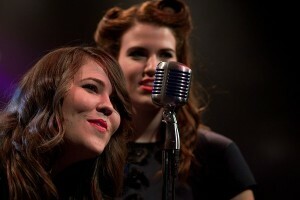 Natives of Muscle Shoals, Alabama, Lydia and Laura Rogers learned to harmonize in church and at family picnics performing classic gems by the Everly Brothers and Doc Watson. They recorded their self-titled debut at Nashville’s legendary Blackbird Studios over two weeks, all on analog equipment, singing live into one microphone. Amazing. The album will be released October 12 on T-Bone Burnett’s Beladroit label, produced by Dave Cobb (Waylon Jennings, Jamey Johnson). I recently spoke with the bright and whipsmart 20-somethings via phone from Nashville, and it was undoubtedly one of the most enjoyable interviews I’ve ever had the pleasure to conduct. They even played along with our off-the-wall 12 QUESTIONS WITH . . . feature. Enjoy! Enjoy! So, where are you right now? We’re in Nashville at our media/PR office. We’ve had a busy day of talking to people and trying to get the word out about the [self-titled debut] album that’s coming out next week. There certainly is a buzz about the album. You first sang as ‘The Rogers Sisters,’ so where did ‘The Secret Sisters’ come from? Oddly enough, someone else had taken the name ‘The Rogers Sisters’ and they were not willing to let us use it, so because of trademark laws we decided we need to find a different name. We liked the idea of using the ‘sisters’ part of it just because it’s so classic sounding. We dug around for months and months to try to find something that wasn’t already taken, and our manager stumbled across this phrase, ‘The Secret Sisters,’ so we did some research and it was not taken. We thought it worked because up until that time nobody knew who we were — we just kind of walked out of Alabama and became a recording act. It’s become a sort of self-fulfilling prophecy, so to speak. I’ve heard that one of you went to business school, or studied business in college. You sound very business savvy — are you that sister? Yes, I am. I’m the older of the two [Laura]. I graduated last August and I wanted to be a music publisher. [Laughs] Obviously, there were different plans being made for me, so I’m learning about publishing, but I’m learning it in a sort of backwards way. It’s weird how you prepare for something, and you end up using it in a totally different way. How old were you two when you first started singing together? We’ve always sung together, but not professionally. We didn’t start until we got this record deal. It’s been a learning process for us. We’d never performed on a stage anywhere, it was always just in our livingroom or family reunions and in church. It was there, in church, that we learned how to sing, but we’ve been singing since we were little. As far as public performances, we didn’t start doing that until January or February of this year. Did you sing a cappella in church? The church we grew up in — and we’re still attending — doesn’t use musical instruments at all, so we had to learn to read shaped notes and blend with each other and harmonize. That’s how we trained our ears; we didn’t realize it at the time, but that was what helped us learn to blend our voices and not overpower the people sitting next to us, and to be able to hear the harmonies. Whether or not you’re looking at notes on a page, just to be able to hear which harmony would sound good with a certain note, that was our most formal training. Do you think this natural ability is stronger in siblings? I mean, look at the Louvin Brothers, Everly Brothers, Andrews Sisters, Wilson sisters of the band Heart, Avett Brothers — do you think genetics play into it? Definitely. History has proven that some of the tightest harmonies are blood related, that has a huge part in it. The way we talk is similar [Note: I had difficulty distinguishing Lydia from Laura when they answered] and the tonality of our voices are similar, so there are times when it’s hard to depict who is singing which part. You recently played the Hardly Strictly Bluegrass Festival in San Francisco. The lineup was amazing, so what was it like for you to perform there? It was insane. They told us that there were 40,000 people that we were performing in front of, and it was really different for us and humbling as well. We only performed two of our own songs, but we did some background vocals for Karen Elson, T. Bone Burnett and for Elvis Costello. That was cool, like a big party up on stage with people coming and going, and the crowd was super responsive. That was our first open-to-the-public performance, so to have our first show there was pretty exciting. You had heard of most of the artist who were there, right? Oh yeah, we were big fans of Jenny Lewis. Did you get autographs and totally gush over your favorites? [Laughs from both — in harmony!] Right, no big deal. You recorded your debut at Blackbird Studios in Nashville over only two weeks. Did you feel rushed at all? No, it was really laid-back and it flowed really well. Our producer [Dave Cobb] was really great; he didn’t put any pressure on us, just said if we happened to finish it in two weeks, then we’re awesome, and if it takes longer, we’ll do that. He just wanted it to be very organic, didn’t want us to be stressed out. We had the best time and really bonded with the musicians. Blackbird is known for its amazing collection of equipment, so everything was really easy and we didn’t have to think about it. They were great sessions. Did you record there specifically because they have older analog equipment? That was the main reason we recorded there. We wanted to be true to the era, but another reason we chose to record in Nashville was that we knew we were going to be targeting a country sound, so something about going to Los Angeles or New York didn’t feel right. If we were going to do a tribute to country music, it needs to be recorded in Nashville. How did you go about choosing the songs for the album? That was a collaboration between us and Dave. We put our heads together and tried to find songs that we thought would match our voices well. We chose songs by George Jones, Hank Williams . . . there were so many to choose from, it was pretty tough. T. Bone came in and recommended a few songs, but it was just digging through tons of really great material and trying to find, well, how do you find eleven songs out of . . . Right. It’s like Rosanne Cash’s The List — how do you condense that iconic list of songs down to one album? Exactly. We got spoiled, because we heard all these great songs and we thought what could we possibly write that would be as good as this? It would be easy to just do cover songs for the rest of our lives, but we are trying to become more proficient at songwriting and we definitely want more originals on the next album. So there are two originals on the album, right? I actually heard ‘Tennessee Me’ on the radio the other morning. We have an amazing station in Atlanta, WMLB AM 1690, ‘The Voice of the Arts’ that plays all kinds of stuff, old timey, country, blues, roots, jazz, and now you! That’s so great! Most of the time we know where we’re going to be appearing, but we have these moments where people say they heard us on the radio or someone saw something on TV about us, and it’s all starting to filter back down to us from the fans who are listening. That’s a really cool thing to hear. 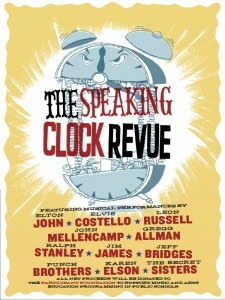 You’re going to be performing soon in Boston at T.Bone’s The Speaking Clock Revue. Yeah, we’re really stoked. It’s pretty wacky to just have your first album coming out and you get to share a stage with Elton John . . .
Are you nervous at all? Well, we try not to think about it. If we dwelt too much on those things it gets in our heads too much, so we take things a day at a time and just roll with it. So I take it you two are comfortable in the spotlight. [Huge laughter] Umm, we’re still getting used to it. We’re learning how to be comfortable on stage. When did you first meet T. Bone Burnett? We met him back in May . We got wind from our record label that he’d heard our music, and he loved our voices and wanted to meet us. We flew to L.A. and sat around talking, played a few songs for him and then find out that he wants to get completely involved and help promote our career. It was kind of like winning the lottery for us. He’s been a really beneficial ally to have on our side. What was your first impression of him when you met him? Yeah. [Laughs] He’s a tall figure, literally. When we got in the room he was very down-to-earth and normal and very knowledgeable about music history. We’ve hit it off, and he’s become a real dear friend — like our great uncle or something. He’s been a really special person. So, how was New York City? You recently performed at Joe’s Pub. That was a cool venue. It’s built over the subway, so every few songs you could feel the subway cars going under and everything was shaking. We’d already had our Los Angeles and Minneapolis showcases, and Nashville, so we didn’t really know how the New York crowd would react to us. It was actually an overwhelmingly positive reaction. We actually got a touring opportunity out if it: we’re doing a few dates with Ray LaMontagne and Levon Helm in a couple of weeks. And now for our 12 QUESTIONS WITH . . . where we ask 12 off-the-wall questions, not all relating to music. Are you ready? [Laughs] Let’s go for it. Sounds like fun. We’re staying with a friend in Nashville. She’s cooking some sort of soup with chicken and cheese, a homecooked meal courtesy of my best friend here. 2. List five items currently in your refrigerator (or, if you’re on the road, in your cooler, glove compartment, backpack, or suitcase). Oh, we can talk about what’s in our suitcases. Fake eyelashes [laughter], curling irons, fingernail polish . . . what else . . . a bunch of lanyards from all the festivals we’ve been playing, and bright red lipstick. 3. Buck Owens or Roy Clark? [In perfect unison] Buck Owens! 4. What are you listening to these days? I’m listening to Mumford & Sons. And I’ve been listening to a lot of Adam Duritz, and I’m always listening to Brandi Carlile. Pardon me, but I still can’t tell your voices apart. [More laughter] This is Lydia: Mumford & Sons. Laura is: Adam and Brandy. 5. What was your first paying job? [Lydia] I worked at a daycare in town. And this is Laura: I worked at a gas station that was also a bait house, it was right on the river in Alabama. I had to dip minnows and crickets out of the bait house, literally had to stick my hand into a box of crickets and pull them out for fishermen. It was horrible — and glamorous! 6. What was your first paying music gig? Ohhh. We played a little show at a theater called the Roxy in our hometown. We got paid $25, which was basically gas money to get there. 7. Did you always know you wanted to be professional musicians and singers? I always — this is Lydia — I always wanted this, but I wasn’t sure if I could make a living from it, so I went to school for graphic design. [Laura]: I never thought I would be a singer; I just wanted to be behind the scenes in music, to be a publisher. 8. What record or artist changed your life when you first heart it or him/her? [Lydia]: I’m a big fan of Fiona Apple. She really changed the way I think about music. For me — this is Laura — it was definitely Brandi Carlile. I talk about her in every interview, but literally she changed my life musically, unbelievably so. I am so inspired by her, and her stage presence, her writing, her performances . . . just, oh . . . over the top. 9. Prose or poetry? And do you have a favorite writer? Poetry for both of us. My favorite poet — Laura — is Walt Whitman. [Lydia]: Yeah, me too. [Laura]: Copy cat. [Lydia]: I’m not a copy cat! 10. What does Nashville mean to you? This is Laura speaking. Nashville means everything to me. I lived here for a few years when I was going to school, and I always think of Nashville as home mainly because this is the town where we were discovered. It was Nashville that offered us the opportunity to be heard, and to know that it all started here . . . It was where your first audition was held, right? That was back in October of 2009. They held an open audition here. 11. This may be a bit premature, but . . . If you were inducted into the Country Music Hall of Fame tomorrow, what would be the opening sentence of your acceptance speech? Oh . . . interesting, umm, probably ‘Thank you Mom and Dad for everything you’ve ever done for us.’ Our parents are phenomenal people. That’s without a doubt the most popular answer. Sweet, oh I’m glad we’re normal! 12. What’s next for The Secret Sisters? Our album’s coming out a week from today [album drops Oct. 12th] which is kind of a big deal for us. And then we’ll go on The Speaking Clock Revue with T. Bone and friends, and then we have our Ray LaMontagne dates. Next year there’s talk about us being in a movie, perhaps, that T. Bone is directing the music for. So, basically we’re getting down to work and touring, and getting out to meet the people who are buying the record. We’re in it for the long haul. Im super bummed I missed them when they were in LA. Next time I guess. Above…in an answer, you transcribed their words as “learn to reshape notes and blend”…that’s incorrect. It should have read “learn to read shaped notes and blend”. The distinction is very important, because shaped notes are just that…so do, re, me have different shapes. We (Church of Christ and others) don’t learn to read music in the same way as musicians. We learn relative steps from note to note …it’s hard to explain, but beautiful to hear. Thanks for the clarification. We really appreciate your detailed reading of the interview.